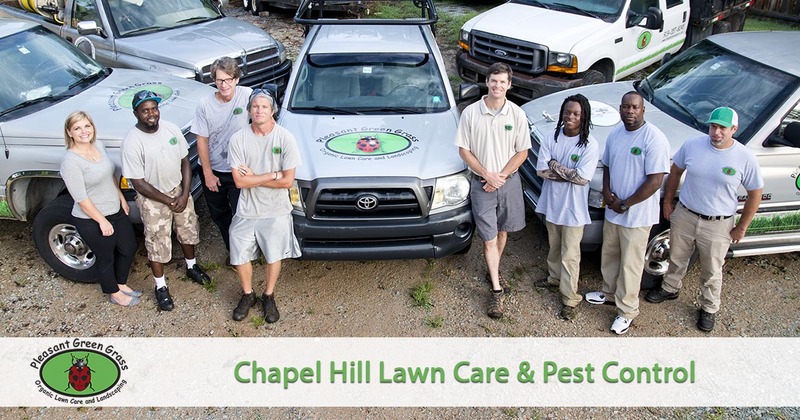 If you are looking for effective lawn care and pest control services in the Chapel Hill, NC area that are safe for your family and pets, then look no further. Pleasant Green Grass offers organic lawn fertilization and pest control services that are safe for your family and pets. Chapel Hill, NC, has the nickname of the Southern Part of Heaven, and with good reason! Everything you could want is here in the city. But that also means finding the right service provider for your home can get challenging. How can you find the home lawn care that’s best for you? At Pleasant Green Grass, we remain the top name in landscaping services. Since 2006, we’ve applied entirely organic methods to achieve the best yards possible! Call today for your best lawn care provider. We achieve your perfect yard each time! We offer better monthly maintenance services that continue to promote better growth. You can choose us for the best in lawn fertilization and weed control, and more! Impacted yards benefit from our yard aeration services, while a whole lawn renovation is easier than you think. Whatever lawn care services you need, we offer it all for less! Stop spending too much on landscaping methods that hurt your plants. Instead, choose the natural approach by hiring us! Are pests preventing you from enjoying your yards? Then let us take care of them! Rather than rely on harsh toxic chemicals, we still use 100% organic methods. Fleas, ticks, spiders, even grub, and mosquitoes aren’t safe from our pest control! There’s no need to poison your yard just because you have bugs. Call us today to better protect your lawns without the sprays! From pesky weeds to biting bugs, we handle all your yard care concerns. Call us now to give your yard the best service possible! The organic lawn fertilization and pest control services we offer in Chapel Hill, NC are healthier, safer, and more effective than traditional chemical applications that are harmful to people, pets and the environment. Give us a call today and experience the difference in working with a company that cares as much about the safety of the products we use as we do for our customers.